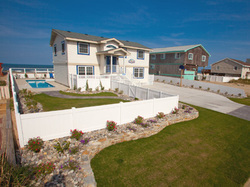 Earn a chance to Win a Free 3 day stay at an Oceanfront home! 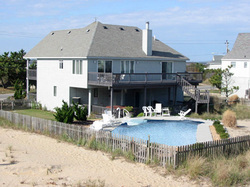 Here are a collection of houses that are currently available for use of weekly vacation rentals. 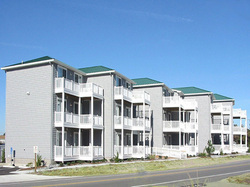 Very comfortable and well maintained homes ready for you! Wide range of bedrooms to fit all your needs. Click on any of the homes below to find more information & see more pictures. Incredible ocean views from majority of rooms in the house. 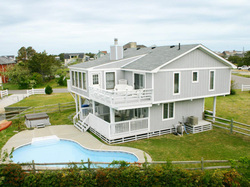 Especially with the glass fence for unobstructed ocean views. 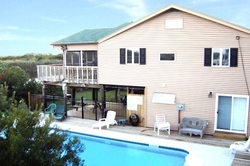 You will enjoy the large pool, Basketball half court and Horseshoes. Bring your pets! 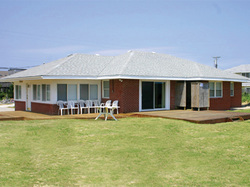 New swimming pool with great deck area including a poolside bar with great views of the beach. Ping pong and Foosball tables will keep you entertained along with a beach volleyball court. Hot tub on the top deck. Pets welcome! Newly renovated with amazing ocean views. Great rec room with Ping Pong, Foosball and Air Hockey. Outdoor pool and hot tub. Pets allowed! 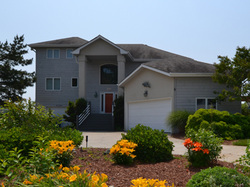 Beautiful spacious and open floor plan with views of the Atlantic sunrise and Back Bay sunsets! Full of amenities including a private elevator. 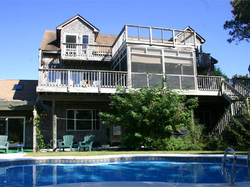 Wrap around deck with cabana area and wetbar perfect for those hot summer days. Beach decoration throughout the home with brand new carpets! Rec. room with pool table. 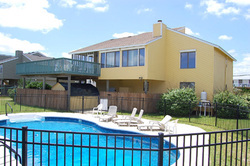 Swimming pool, hot tub and large furnished decks. Also has Horseshoes outside! Perfect for a family vacation. Beautiful waterfront home on the back bay/canal area. Extended back deck with screened porch. Always something to do with this house full of amenities including a kayak to explore all the wildlife! Great Spacious three level home. Rec. room with Foosball table. Large swimming pool with lounging area perfect for sun bathing. Just a short walk to the beach! 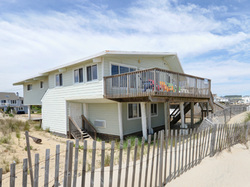 Great location with views of the ocean and only steps to the beach. Also close walk to the market, restaurant and shops. Full of fun amenities including hot tub, outdoor Ping Pong, Horseshoes, Basketball court, Golf and Volleyball! The perfect family retreat. Keep your entire family entertained with great features such as a Swimming Pool, Pool Bar, Hot Tub, and a Huge ceramic tiled Family Room with Wet bar, Pool Table, Foosball Table and TV! Newly Renovated with great views! Large pool area. 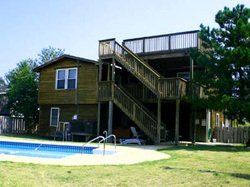 Play Corn Hole or Ring Toss outside to enjoy the weather or relax in the hot tub. You'll love the close proximity to the market and shops. Close to the Life Guarded beach area. Scenic ocean views from the living room and sun room. 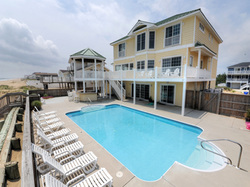 You will be kept busy with the swimming pool, hot tub and basketball court. Great for entertaining with large decks on the front and back of the house with a bar area outside! 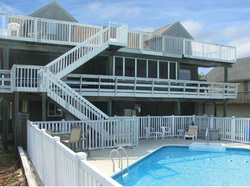 Premier ocean views with multi level decks, skylights and large windows. 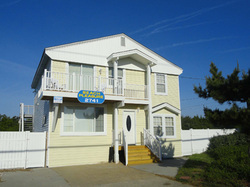 Located on a large corner lot with direct beach access! Just steps to enjoy the sun and sand. 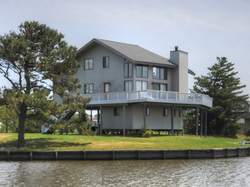 Updated home right on the bay surrounded by water on 3 sides for breathtaking views you wont forget! Your family will be entertained all day long from fishing to swimming or spending rainy days playing some Ping Pong! 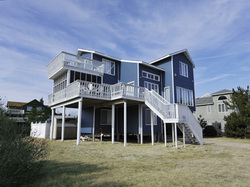 This home has everything from beach access to canal access. 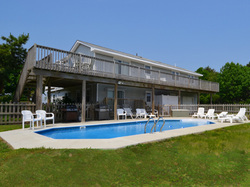 Newly renovated with large pool area and beautiful decks to enjoy the views. Plenty to do in the Rec. room or enjoy the back back from your private dock. This beautifully landscaped, fabulous, five bedroom house, features tastefully done furnishings and art work. Breathtaking ocean views. Relax in the hot tube or in the fully equipped rec room. Pet friendly! The refreshing pale beach colors will start soothing and relaxing you the minute you walk in the door. Rec. room with pool table. Complimentary Wi-Fi internet. Large deck to sit and relax. Pets welcome! Charming cottage right on the ocean! Enjoy the beautiful sunrise over the Atlantic on the spacious open deck. Recent upgrades to house including hardwood floors and updated kitchen. Great views of northend lake and the canal. Private boat deck for fishing or kayaking! At night enjoy the pool with fiber optic lights, or relax in the hot tub! Great spacious family home, pets welcome! 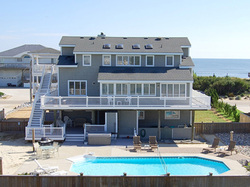 Enjoy the ocean views from the over sized deck or the wall of windows in the living room. Full of fun with Foosball, Ping Pong, Horseshoes or Basketball. Only minutes to the beach! 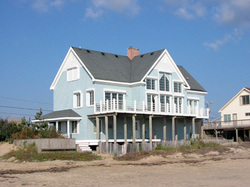 Lovely 3 level beach house. 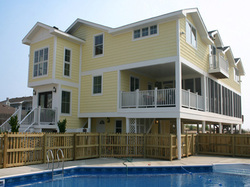 Multiple level decks including a screened porch and swimming pool so you can enjoy the hot summer days. Beach access path right across the street. Dogs allowed. Spacious home with great natural light. Get the best of both with views of the ocean and then views of the sunset on the back bay. Swimming pool with bar. Fully equipped with tons of amenities to entertain all ages. Pets welcome! Canal front home where you can enjoy the sunsets on the back bay! Own private dock and a short walk to the beach. Pool table and Ping Pong table for a fun friendly game. Great rental for you and your family. Beautiful home full of natural light and bright decor. 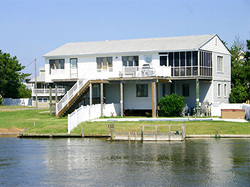 Located on the Back Bay you can enjoy it on the kayaks provided. Covered porch is a great place to relax or play some Basketball! The place for family is here! Recently updated throughout, spacious home with modern furnishings. 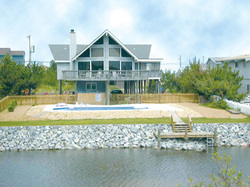 Right on the canal with only a short walk to the beach! Large swimming pool for those hot days. Perfect location with the canal at the back door and the bay at the front. Enjoy the pool or large decks perfect for enjoying the sounds of nature. Large kitchen and great family Rec. room! High cathedral ceilings and lovely furniture throughout. 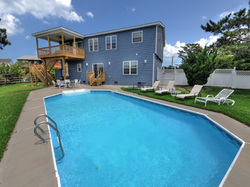 Enjoy the weather sunbathing by the pool or hang out on the sundeck. 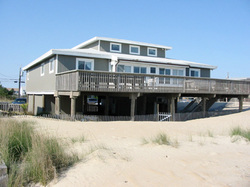 Located on the quiet North End of Sandbridge. Great location, only short walk to the beach. Enjoy the sun around the pool area or the screened porch. Professionally decorated with hardwood floors. Newly renovated including new kitchen with granite counter tops. Enjoy the sunset on the canal side of the home or go for a swim and lounge on the deck. Beach access right across the street! Pet friendly. 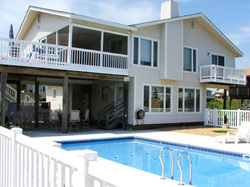 You will love this rental right on the canal with beach access directly across the street. Completely private under deck area is perfect for barbecues. 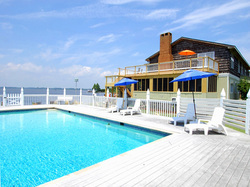 Enjoy the nature of the Back Bay from the screened in porch or relax by the pool! You will enjoy this spacious home with all rooms on a single floor for convenience! 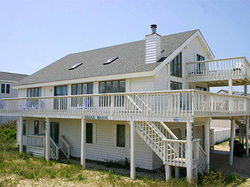 Oceanfront enclosed porch area is perfect to relax or read a good book. Short walk to the beach and you can even bring along your pets! Perfect for a cozy, relaxing beach vacation. Open deck looking over the ocean is the place to relax, or go play a game of Basketball right outside! This home is also "Handicapped Friendly" with ramps and rails throughout the home. Enjoy the sunrise and sunset from the front and back decks. 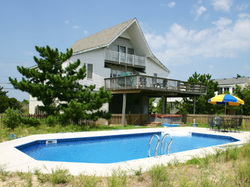 Go for a swim in pristine pool or star gaze from the hot tub. The loft on the third floor is a perfect place for the kids to play and even your pets! 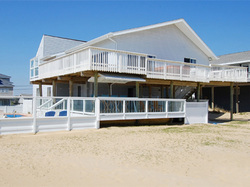 Located right on the Bay, perfect home for those seeking breathtaking sunsets and views of nature. Open living room full of light and nicely furnished. Enjoy the views from the deck or play a game of Horseshoes! 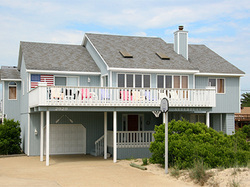 Contemporary beach home with vaulted ceilings perfect for a small family gathering. 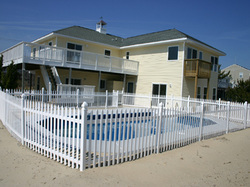 Large fenced in pool for your family and pets to enjoy. 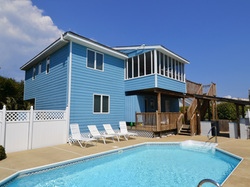 Soak in the hot tub or watch the breathtaking Back Bay sunsets from the back deck! Penthouse with great furnishings and updated kitchen. Loft area perfect for the kids to play! Grand master suite with jetted tub. View the gorgeous sunrises from your porch. Only a few steps to the beach with Life Guard on duty! 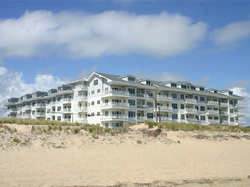 3rd floor condo with great views of the ocean! Spacious, nicely furnished rooms. Only a short walk to the beach! 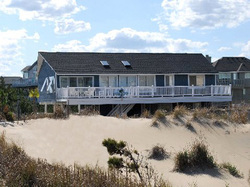 Interested in buying a Vacation Home of your own? 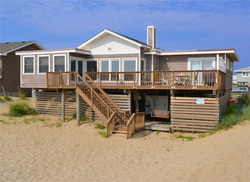 Go to Sandbridge.net or use the side navigation bar to look at homes currently for Sale.